AINTREE, LIVERPOOL — Ghosts of horses that died trying to conquer the Grand National fences have reportedly converged on Aintree in Liverpool for the Crabbies 2014 Grand National. 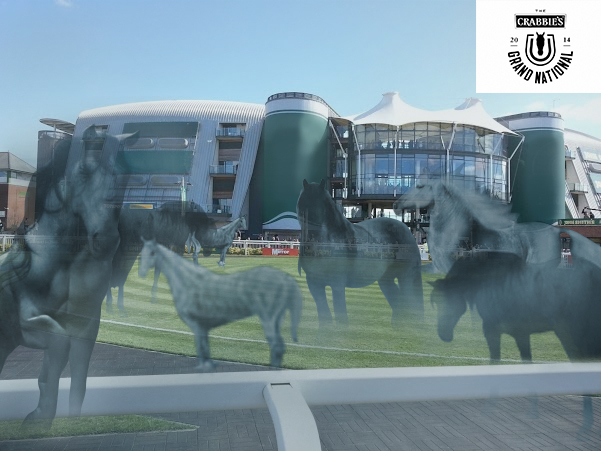 Sources confirmed that since the start of the annual Aintree festival on Thursday, scores of ghost horses have been seen emerging from the Aintree Equine Cemetery and making their way through the town to the Aintree racecourse in preparation for the race dubbed the greatest steeplechase in the world. While the strutting and galloping ghost horses have reportedly spooked the town’s people and tourists, the ghost spokeshorse, Dark Ivy, has been giving interviews in a disembodied voice to allay the supposedly unfounded fears of the UK race lovers. At post time the British Horseracing Authority have reportedly offered to triple the wages of any jockeys who volunteer to ride the ghost horses, with sources saying that there have been no takers as yet.